LinkedIn is the biggest business to business social network, with huge levels of engagement: 35% of users access the site daily. If you’re looking to engage with business people it’s where you need to be. LinkedIn Company Pages are a great way to create a bigger footprint for any organisation, enabling you to highlight the key areas of your charity, get recommendations and post updates. Whether you want business people to sponsor a coffee break, come on a golf day, or nominate you as their charity of the year – a LinkedIn Company Page is going to build awareness of you, and raise your professional profile. Once you have it all set up it becomes a mini-brochure. How can a charity use the Products / Services Pages? Every business should think creatively about what they define as their ‘products’ and ‘services’ on LinkedIn. For a charity you might choose to highlight specific fundraising campaigns, an event, or your shops like Oxfam does here. Alternatively you might focus on the services you provide and how you help different people, like the NSPCC does here. How can people interact with it? As with all social media, the more engagement and interactions you get with your LinkedIn Company Page the more it will do for you. People on LinkedIn can interact with your Company Page in a number of ways, all of which will raise your profile. They can follow you, comment on your updates and recommend your products / services. All of those are great for your charity’s exposure on the site. 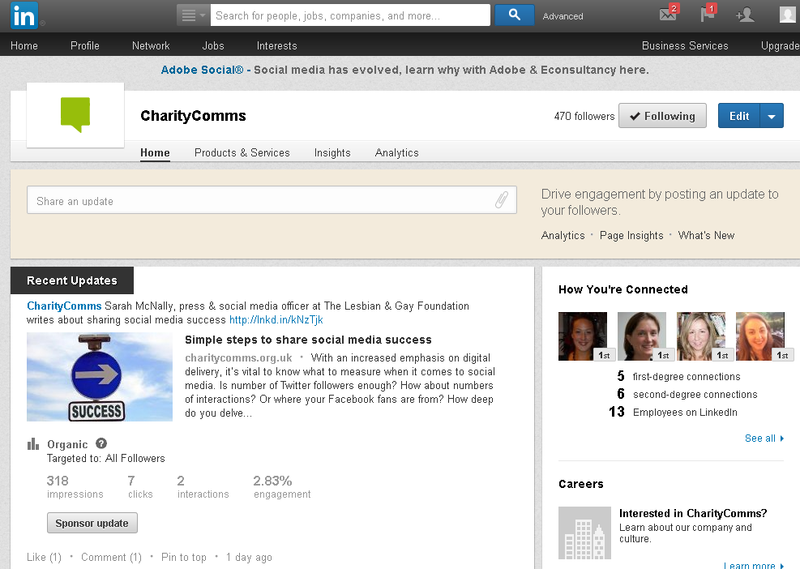 Want to interact with CharityComms? Check out our membership badges for use on your pages including LinkedIn. Of course, getting the engagement takes a bit of leg-work to start with, once it reaches a critical mass it’ll look after itself. The challenge of how to get it going remains. First off – tell your networks about it, and get them to follow the page. Then ask people who’ve used one of your products / services to recommend it (this is really easy to do from the product / services page). Don’t ask everyone on the same day, spread it out over a couple of weeks. Finally, post interesting updates – about one a week is fine, and do different things. So a blog post one week, a news story the next, and an event after that. Then you can use the analytics to see which got the most interactions and do more of that type of update. Chloë Thomas is the founder of indium online, and the author of eCommerce MasterPlan.